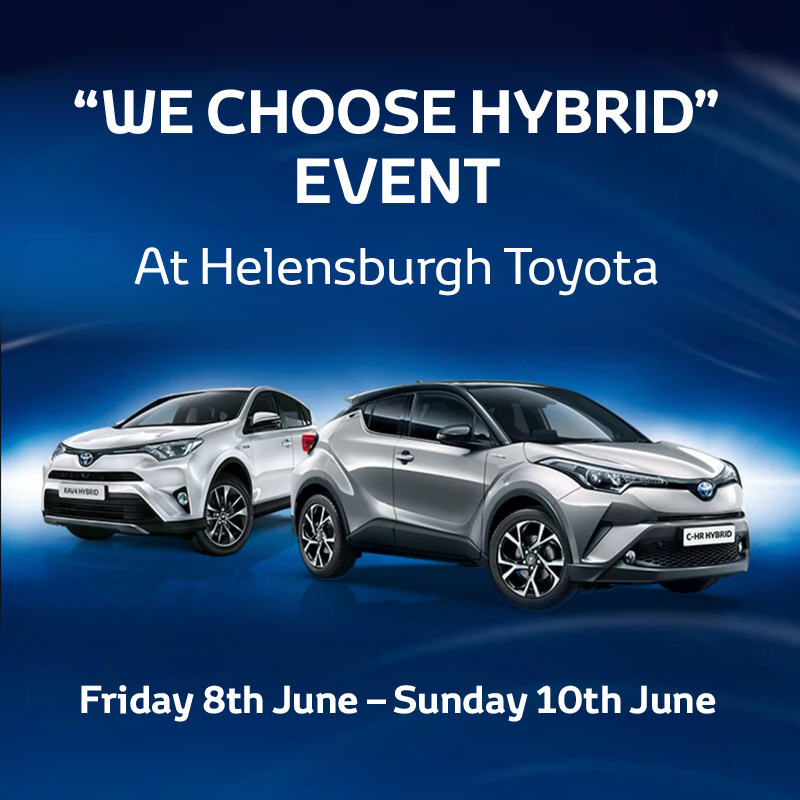 Following on from our previous successful “WE CHOOSE HYBRID” EVENT, we will be holding another from 8th - 10th June 2018 for those who were unable to attend the first time around. It’s time to leave the old way of driving behind. Toyota Hybrid cars save fuel, reduce emissions and even recharge their batteries without being plugged in. You might think they are complicated to own, yet the opposite is true – they are designed to make your life easier. Find out exactly what is a hybrid car, how they work and how they can save you money by attending our exclusive “We Choose Hybrid” event. With the largest range of hybrid vehicles of any manufacturer, including Yaris, Auris, RAV4, C-HR and of course the legendary Prius, we will have the vehicle to suit your needs. This is the opportunity to test-drive your vehicle of choice and experience the versatility and driveability it delivers whilst putting the frugal hybrid technology to the test in our ‘Hybrid Challenge”. Hybrid technology makes financial sense because the petrol and electric motors work seamlessly to deliver outstanding economy. It costs the same to service a hybrid as a conventional Toyota however there’s less wear and tear on the brakes and there is no clutch, alternator or timing belt to replace. During this event, we will be offering 2 Years’ FREE Servicing† on all hybrid models plus 0% APR Representative* on selected vehicles. Bring a friend and you will both qualify for these event offers. Hybrids do not need to be plugged in. There are no cables, no sockets, no waiting around to charge, just jump in and drive off. During this event our experienced team will explain how Toyota hybrid technology works and how it benefits you in our modern world. Plus there will be the opportunity to find the answers to questions you’ve always wanted to ask. We’ll probably bust a few myths along the way! To find out more and discover how you can benefit from switching to hybrid book an appointment now for our “We choose hybrid event”.